It was June the 22 in 1996 on a Saturday when we drove to a fellows farmhouse. It was the night that Holland had to play France in the European championships. It was around twelve o’clock when my friend and I decided to leave. We were the first to leave. I had to work the next day and I don’t like to go to bed late on work nights. We thanked our host and walked outside immediately I saw a disk like object with many lights under it circling above the farm house. It was nothing that I’ve ever seen before and I said to my friend, hey look at that, my friend thought that it is was probably from the highway. Imagine if you will total darkness on an old farm house road, no houses just a country road the highway was four or five miles away. We stepped inside the car and drove west towards a major road. My friend said that the object was flying adjacent to the car on the passengers side. I looked and saw it, turned left and the object turned with us when I speeded up the object speeded up as well, turned right and it proceeded to follow and the same speed. We drove another few miles and this object kept the same distance from the car. I guess I got brave, our stupid, and stopped the car, got out to take a better look at the object. It was spinning in a slow way counterclockwise and then stopped above a house on our right side, then started turning clockwise back towards us it was interacting with us. To get an approximation on the size of it I would have to know how high that he was flying, what I do know for sure is that it was close and large the size of a couple of football fields. It made no sound. It flew over the car a couple of times. After a few minutes I got back inside the car. Trying not to alarm my friend I keep my thoughts to myself. I drove on turning left on the middle peel road We thought that we had lost him because of the low tree line but that illusion was short lived, because one minute later it was back on the passengers side of the car. When we reached Boekel we were driving under a lot of trees so we couldn’t see anything following us. My friend said to drive faster and hide the car under our garage so I did, we got out of the car and ran inside the house. When I told the baby sitter she said ” it was a shame that she couldn’t have seen it”. Me being of the nosey types had to look outside and to my horror it was hovering above the neighbors house. But now it was very close and I could see from the lights that he was slanting down in my direction, looking at me. 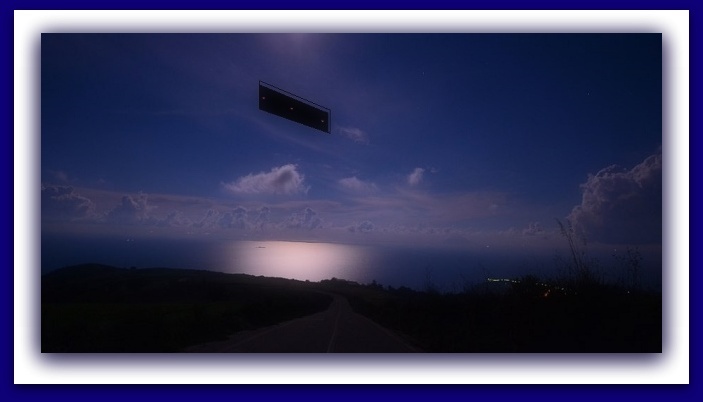 I could see this because when this object was following us home we saw the whole underside with all the lights turning clockwise or counter clockwise now I could only see a row of lights where the lights were turning they were disappearing on the side and reappearing on the other side. I called for the baby sitter and my wife to come outside, but when they did the thing took off like a rocket it was like it just disappeared. Note that this was instantaneous and did not make the slightest noise or wind like a helicopter would do. Being a prior air force sergeant I know what the military has. When the two ladies went back inside a minute later it came back. And I called the ladies back. This time the object stayed and the baby sitter turned a little shade of white and said that she was going home because “this is scary” then she departed for her house. Just then (name removed) my neighbor, was returning home from a party. Walked over to me and the object took off again. When I told Jan of our “strange night” He laughed and I told him to stay put, it will come back, just then it returned and Jan was surprised He had never seen anything like this and a couple of minutes later it took off and we went back inside. Hoping that it would just stay away and it did. In this weekend we heard on the news that there were a lot of UFO sightings in that weekend. when I saw MUFON case that is exactly what we saw on the night in question. that is why I’m reporting this to you. I had already reported to other sites 20 years ago. NOTE: The above image is CGI. 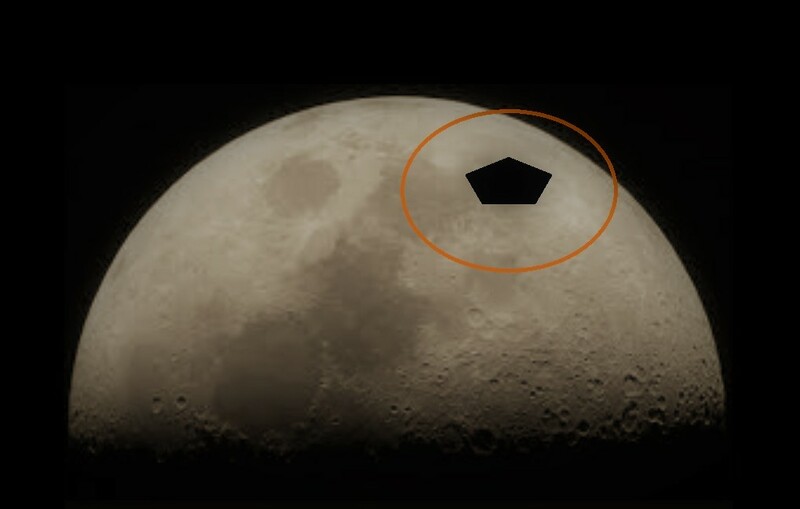 A fast-moving, pentagon-shaped object rapidly transiting across the northern face of the moon. Observation of a Fast Moving Lunar Transit Anomaly Jacksonville, Florida, June 23, 12:31 EDT. At about 0:31 hours (12:31 EDT, to the nearest minute) this morning, I was observing the waning gibbous moon from our driveway with a 4.25” f/6 reflecting telescope. At the time, I was using a magnification of about 100X with a # 21 orange filter. Although the rising moon was still low in the SE, seeing was quite good, and there were no clouds or haze. While observing features on the lunar terminator near Mare Serenitatis, I noticed a fast moving, solid black pentagon-shaped object traversing from west to east [moving from the terminator roughly in the direction of Mare Imbrium] across the lower (mid-northern) portion of the moon. The estimated time of passage before it swept out of the eyepiece’s field of view was – my best guess – well under five seconds. As I was not wearing a watch, I immediately went inside and looked at a wall clock (known to be accurate within a minute or so), and recorded the time. The most unusual aspect of this observation was the shape of the object. Because it swept across the field of view so rapidly, I am not 100% sure that I am getting this exactly right, but my recollection is that its silhouette was something between a pentagon and a five-pointed star, as shown on the accompanying drawing. This rendering is based on a quick pencil sketch that I made within a few minutes of seeing the object. The thing that sticks in my mind is that this object was inky black and perfectly symmetrical – with no change of shape or tumbling effect as it crossed the face of the moon. As to the object’s size, I have tried to relate it to some of the named lunar craters in this area, and – again, to the best of my ability – it seems to have had an apparent angular size midway between that of Menelaus (27 km) and Manilius (39 km), so my best guess would be an apparent size of about 30 km, as projected against the lunar disc. Based on its eastward trajectory, moving roughly in line with the ecliptic, my suspicion is that this is some kind of large, earth orbiting satellite – but what could it be? Although I have never witnessed a lunar transit by the International Space Station, I am familiar with its appearance, both as it has been imaged in telescopes and as it has been photographed traversing the moon, but the object that I observed looked noting like this. Has anyone else seen anything like this? At approximately 9:54 PM on Tuesday, June 23, 2015, I observed an object traveling very slowly in a south-southeasterly direction. The object when initially sighted was almost due west of my location in Myrtle Point, Oregon, at an approximate distance of less than 2 miles. Some high cirrus clouds were present and the sky was not totally dark yet. The object initially had the apparent size of about 1.5 moon diameters. Object was at about 15-20 degrees elevation observed from my location, and very slowly traveled south southeast. Best guess at altitude, less than 5000 feet. The object gave the impression of being roughly rectangular shaped, with the long dimensions oriented north-south. When observed early on with binoculars, the object gave a hint of a grey to charcoal black color. 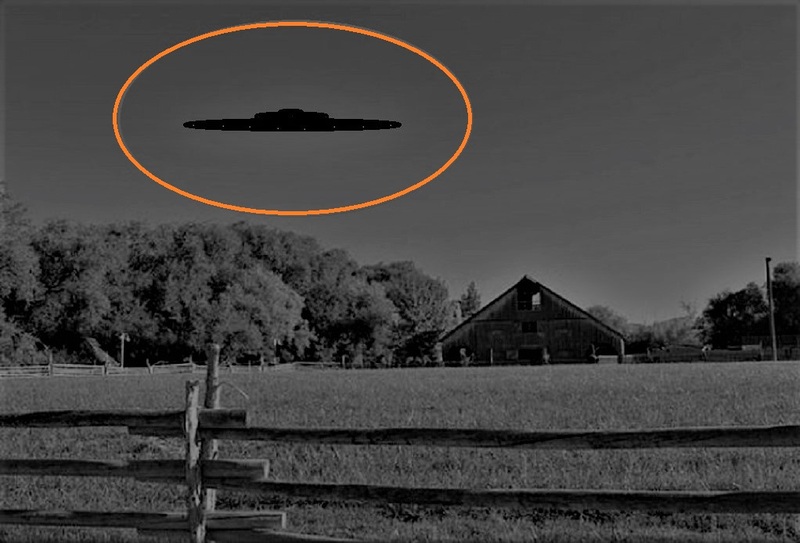 Multiple orange lights were observed at various points along the object and a bright red flashing light, perhaps at the rear or underside, was visible the entire duration of sighting. The orange lights appeared to change position/orientation or turn on/off as the object traveled, giving the impression that it may have rotated or turned left/right on a few occasions but always maintaining its south southeasterly course. The red flashing light did not appear to be perfectly rhythmatic as it seemed to occasionally vary the length of duration on or off. The object spent about 20 minutes moving south and slightly east towards the Siskiyou National Forest area until blocked by trees and my local terrain. NOTE: The above image is a rendering.